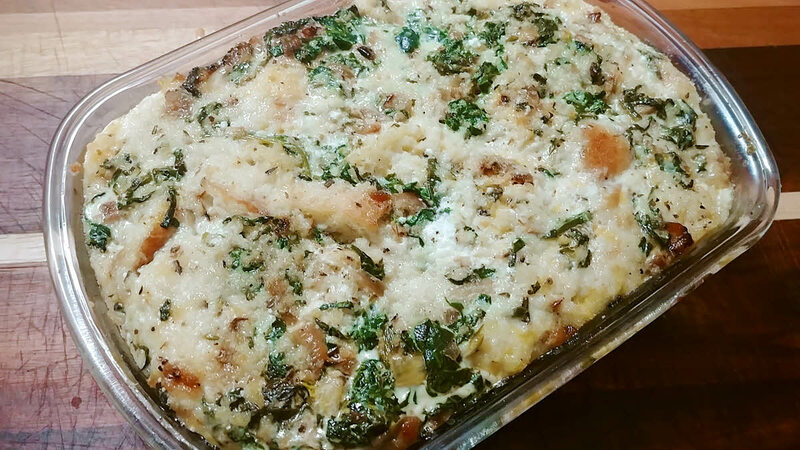 Savory Bread Pudding reminds us of a quiche, without the buttery crust and without the hassle. It is also a perfect use of the day-old bread you have left over. Just soak the day old bread in a rich savory custard and layer it with caramalized onions, spinach and cheese. It simply makes an elegant breakfast. Heat a table spoon of olive oil and saute chopped onion in it. Once it starts to brown, add the roughly chopped spinach, a pinch of salt, a pinch of pepper and a pinch of thyme. Saute everything until all the water is evaporated. Keep aside. In a large mixing bowl, whisk together the egg, milk, half and half, nutmeg, remaining salt, pepper and thyme until well combined. If you don’t have half and half, you can replace it with half milk and half cream. Break the bread roughly in bite size pieces and arrange in an 8 x 12 x 2 inch baking dish. Sprinkle the cream cheese, sauteed onions and spinach over the bread, then top with the shredded cheese. Pour the custard (egg mixture) slowly over the bread. Let it sit for 15 minutes. You may have to press the bread into the custard to make sure it’s all soaked. Cover loosely with aluminum foil and poke a few holes on top for steam to escape. Place on the center rack of the oven and bake for about an hour or till the center is firm. Remove from the oven and allow to stand for 10 minutes. Savory Bread Pudding is ready. Serve it warm. You could also experiment with some other vegetables like broccoli, mushrooms and asparagus.